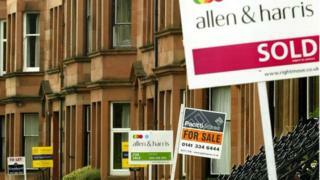 House prices in Scotland will increase by 4% next year, a new report predicts. Recent changes to stamp duty legislation are expected to boost the market, according to the Royal Institution of Chartered Surveyors (RICS) 2015 housing forecast. The report says demand for property continuing to outstrip supply is another reason to expect prices to go up. It also predicts a 2.1% increase in rents north of the border. Chancellor George Osborne announced a stamp duty overhaul earlier this month. Anyone buying a home for less than £937,500 will either pay less tax or the same amount under the new rules, the Treasury said. But the UK system will be replaced in Scotland from April by the Land and Buildings Transaction Tax (LBTT), which will impose higher rates on properties at the top end of the market. Sarah Speirs, director of RICS Scotland, said: "What we need is certainty, clarity and confidence from the Scottish government to keep us building homes. "The stamp duty reform should encourage a greater number of transactions to underpin public confidence and we hope this will continue with the introduction of the land and building transaction tax in April 2015." The RICS forecast looks ahead to the next 12 months across all parts of the housing market, from prices, sales and rents to repossession levels. Across the UK, it expects all parts of the country to see modest price rises during 2015, at an average of 3%. It said that, UK-wide the number of houses taken into possession could fall below 20,000 over the course of the next 12 months. The report found that in Scotland, inquiries to rent property have begun to pick-up once again and comfortably outstrip new supply of rental property from landlords. Simon Rubinsohn, RICS chief economist, said the "long overdue" reform of stamp duty is likely to provide "a tonic for the market across many parts of the country, particularly for first-time buyers". But he added: "That said, the bigger affordability issue is not going to go away, highlighting just how important it is to speed up the supply pipeline of new homes over the coming years."